Do you actually hit each other with the weapons? This is a very common concern amongst beginners. New fencers quickly adjust to the feel of receiving touches, and before long don’t feel them at all. Children and seniors often compete with adults, getting hit just as hard and handling it without any problem. No, in fact fencing is statistically one of the safest sports. Fencers wear protective gear to ensure safety, and the infrequent injuries that do occur are generally minor and common (bruises, twists and sprains). How young? How old? What is the optimum age? 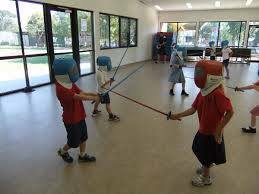 Children can begin fencing at a very young age even at 5yrs old!. National-level youth fencing incorporates under-10, under-12 and under-14 events. International competition for children includes two categories, cadet (under-17) and junior (under-20). Fencing is unique in that fencers generally keep competing until late in life, with veteran events including over-40, over-50 and over-60 categories. The prime age for Olympians is generally from the early twenties to mid-thirties. New fencers can begin at any point in life with great success. Is fencing for men or women? Both! Although there are separate men’s and women’s events at the national and international levels, local events often involve “mixed” events. U.S. women are highly successful internationally, including Olympic gold and bronze in women’s saber. Is it anything like what I see in the movies? No. Modern fencing is a far cry from the choreographed bouts you see on film or on the stage. Instead of swinging from a chandelier or leaping from balconies, you will see two fencers performing an intense athletic dance on a six-feet-by-40-feet strip. The movement is so fast the touches are scored electrically.